Dr AK Padhee, Director, Country Relations and Business Affairs, ICRISAT (4th from left) with dignitaries of RCA Alumni Association, Udaipur. Dr AK Padhee, Director, Country Relations and Business Affairs, ICRISAT, recently delivered a lecture on ‘Climate-smart Policies to Sustain Growth of Indian Agriculture’ at Maharana Pratap University of Agriculture and Technology, Udaipur, Rajasthan. Describing climate change as ‘perhaps the most extreme challenge agriculture in India and across the world is facing today and has to deal with in future’, Dr Padhee went on to highlight a couple of policy options. “The institution of a Panchayat in the Indian context has the capacity to leverage funds from a plethora of schemes. Allocations under the Mahatma Gandhi National Rural Employment Guarantee Act (MGNREGA) can be purposefully utilized in climate-proofing projects such as farm ponds; soil and water management… and many other eco-friendly activities that will adapt and build resilience to climate change,” he said. 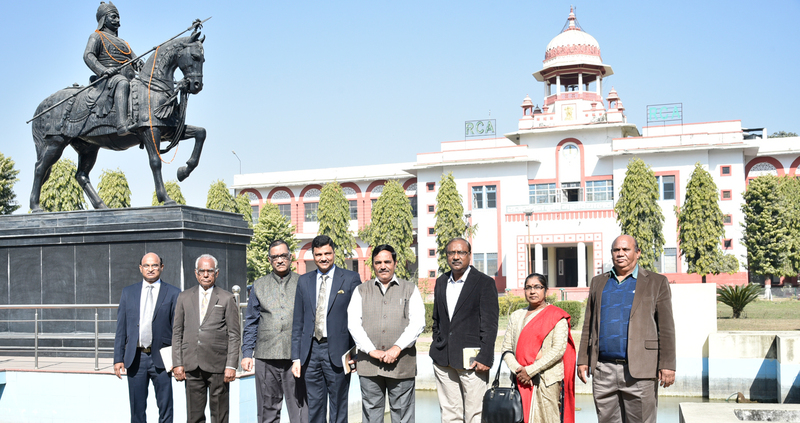 Dr Padhee had been invited to deliver the Dr A Rathore Memorial Lecture at an event organized by the Alumni Association of the Rajasthan College of Agriculture (RCA), Udaipur, on 19 January 2019.